Ask fellow campers about "Icicle River RV Park" and nearby attractions. We stayed a week so got a weekly rate. Great park for visiting Leavenworth. We have stayed here before and been able to be on the river but the site this year was in the row for sites 34-39. It was all dirt and they had done no watering so we had no grass at all. Site was dirty with debris when we arrived and we had to clean it before parking. Site next door claimed the same thing. Some road noise. Internet slow and we were right near the office. Lots of barking dogs. Hardly any sun. Had a power surge the last night that was so strong that even our $400+ 50 amp surge protector did not help as we found out after leaving that the surge had fried the AC board for our frig so had to spend the rest of our trip using LP for the frig. Will cost $400 - $500 to repair. We would return if we could get a site on the river - otherwise probably not. We camped at Icicle River RV Park in a Motorhome. Lots to do in Leavenworth with tons of shops and restaurants. This campground is in the tall pine woods just a couple of miles from all the action in Leavenworth. It is compact so your nearest neighbors are, well, very near. But there is enough room to open slides and awnings, and just barely enough room to park your tow vehicle. It spite of the tight quarters - or maybe because of them -- the host was impressively competent at giving backing instructions and got me to within inches of the desired location on the first try. The laundry room was clean, compact with only 2 washers and 2 dryers, but everything worked well and appeared relatively new. The price was high considering it only includes two people. Additional adults are $5 per nite, and additional children are $3 per nite. A second vehicle is $5 per nite and has to park in a lot at the end of the campground (which might be inconveniently far away, depending on your site). 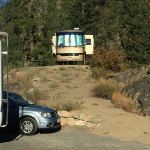 We camped at Icicle River RV Park in a Fifth Wheel. One way entrance/exit - pretty tight! Sights close together. Wifi and cable worked good. Staff pretty nice but appeared stressed. Quiet time was 10 PM. At 8:30, my husband got out his acoustic guitar and we were sitting outside and he was playing his guitar and singing - no microphones! (I had advised the office earlier that we would do that and they said no problem just to stop at 10PM). 15 mins into his playing, a staff member came over and said our neighbors were complaining! We were asked to stop. It is my feeling that published quiet times need to be observed not only by campers but by the staff. Just ranting. We camped at Icicle River RV Park in a Motorhome. Downtown Leavenworth has a great brewery for lunch. Scenic drive to Liberty - a ghost town coming back to life! This should be called Sardine camp. The spaces are tight and all back-in. The lower section has concrete pads and patios, the upper section is all dirt. They over water the grass so all you hear all day is the noisy sprinklers - like a water torture test. The laundry room has only 2 washers and dryers and the floor is always dirty. The Wifi is horrible and the water pressure is weak. We do not recommend this park and will not return. We camped at Icicle River RV Park in a Motorhome. We have been staying several times every summer for the last ten years. The park is very well maintained and the staff is very friendly and helpful. Staff backs you into every site. The park is very relaxing and easy to walk around. We enjoy staying here and will continue for many more years. We camped at Icicle River RV Park in a Motorhome. Nice park right on Icicle river. Stayed in one of the spots in the back and up the hill. Faced the river with a great view up above the water. Sharp drop off in front of our motor home would be cautious with small children. not many trees good satellite. Spotty ATT, good Verizon. All connections worked well.Would stay again. 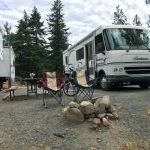 We camped at Icicle River RV Park in a Motorhome. As another poster said, this is a great park if you are a sardine. Sites are very tight and packed closely together with zero privacy. The park is too far from town to walk - you have to drive. We found the atmosphere officious with rules such as no drying towels outside. The place reminded us of the movie the Truman Show. We would not return. Credit where it's due - very clean and everything maintained well. But wifi spotty even for email - kept having to log in again and again. We camped at Icicle River RV Park in a Travel Trailer. This was our second visit to Leavenworth. Still a great location for hiking but we found the town over-priced and lacking fresh ideas compared to our visit 10 years ago. The only reason we'd return is for a hiking trip. Park is located out of the busy town (Leavenworth) right on the water. Beautiful setting with lovely flowers planted throuhout the park. Very friendly, helpful staff. Our Verizon signal was a little weak, so we just communicated with narture. We camped at Icicle River RV Park in a Motorhome. Make reservation in advance. This is a very popular place. Sleeping Lady Bakery nearby. Icicle River is one of the best RV parks we stayed with. The location is nestled right into the Cascade mountains about 4 or so miles outside the town of Leavenworth right on the Icicle River. The managers are top-flight with an eye towards service (he guided us into our site at 9pm at night, in the dark). Step outside your trailer and you're looking at mountains in every direction. We camped here in a 19' teardrop. The sites are a little on the tight side, but that's easily overlooked based on the rest of the site advantages. We camped at Icicle River RV Park in a Travel Trailer. This is a gem of a campground which is right on the river. We came for Oktoberfest and the free shuttle stops here....great perk. This park has an actual jacuzzi spa, which is very hard to find. There is a family of deer that frequent the front of the park to eat the apples. The big-rig sites are long, wide and level; some of the others were not so big. Landscaping was mostly natural but there were several flower plantings near the office. Maintenance was very good. Our Dish satellite worked fine (we managed to find a gap in the trees) but they also offer cable which we didn't use. Wifi was not so great, and our Verizon hardly worked at all. The park was very quiet. We'll definitely come here again. 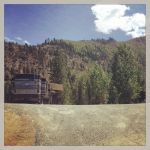 We camped at Icicle River RV Park in a Fifth Wheel. Leavenworth is a very quaint, alpine town well worth the time. Eat at Munchen Haus...the best sausages in town. Also worth a try is Icicle Brewing. This is a lovely park if: You are a sardine. If you don't need cell or Wifi. If you get a riverfront site. Beautiful setting on the Icicle River but very limited access unless your site is on the river. Pros: Large staff, park well managed and well maintained. Hookups in good repair. Laundry [only two washers and dryers] affordable and efficient. Cons: Very tight sites and dead-end roads. The staff assists in parking, by necessity. Only the riverfront sites have any real appeal and there is nothing to do in the park, itself. Too far from Leavenworth for walking. Worst of all: Not only is the Wifi service very poor but the Verizon service is largely unusable, ranging from 4g 1-2 bars to no service. In summary, a river site would be well worth the extra cost but I would probably not return otherwise and would only stay a day or two if I needed telecommunication. We camped at Icicle River RV Park in a Motorhome. Book well ahead and get a riverfront site and don't depend on the cell/Wifi. This was our fourth time staying here. First time was a cabin right on the river. Second time was in a tear drop on the river, third was in a class "C" over looking the river, and finally, this year in a pop-up trailer in the center of the park. Each time the staff and managers were friendly, helpful and courteous. Once we get a new camper we will stay again. Even the dog chilled for the week. We camped at Icicle River RV Park in a Tent Trailer. Make reservations quite a bit ahead of when you want to stay...they are always booked because of the clean atmosphere that the park exhibits. Close to "downtown" Leavenworth (~4 miles) so convenient for groceries, touring, etc. FYI, the ice bags at the park are less expensive than at the Leavenworth Safeway although Safeway does have block ice and cubed while the park just has cubed. Nothing better than a frozen ice cream bar purchased from the office during the hot day(s). This park is located on the Icicle River, and those sites located on the river would of been lovely. We have a class B van and where we were located, site 48, it was so crammed in with RVs, and the sites weren't long enough to accommodate their vehicles, so they were parked in front of their motorhomes. So leaving and coming were somewhat difficult because of all the vehicles off of the road. For us there just was too many sites crammed in together. You need to book way in advance to get a river site, I would go back if I had a river site. Bathrooms and showers were clean. We camped at Icicle River RV Park in a Motorhome. Tis would be a great park if there was a shuttle service or affordable taxi service to Leavenworth. We camped at Icicle River RV Park in a Travel Trailer. Pros Very well kept clean Cons WiFi extremely bad Too many sites for size of park Some sites hard to get into, but they have people to help you get in tight spaces. We camped at Icicle River RV Park in a Travel Trailer. Stumbled into a great restaurant in town. I was NOT in the mood for German food, which is about all that is available, (remember Bavarian themed town.) We found a place near the hospital named "Watershed". Great food. Impeccable service. I'm still talking about the place almost 3 months later! Try the KOA or better but a ticket on a Viking Tour and see the real thing. Whoever owns this park needs to take a close look at how it is being managed. 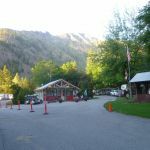 Leavenworth has free RV parking 2 blocks from downtown area - a short flat walk. The Leavenworth National Fish Hatchery gives a great history of salmon in Washington state. We loved Munch Hausen restaurant in town. Great brats and the Dark Persuasion beer is sooo good! Icicle River Gorge trail is a nice 3.6 mile hike on mostly flat, shady trails. Take a left out of the park and go all the way to the end, keep going on the gravel parking lot until you see a parking lot on the left. You can take the dog too! Enjoy shopping at Leavenworth shops, go to Soup cellar to eat! Good food, good prices! Sandwiches or burgers. There's rafting trips down the river, zip-line tours, taxi services from RV campground to Leavenworth. Great restaurants and shopping in Leavenworth. Lots of wine-tasting options throughout the village. Lots and lots of things to do nearby! And great food too! Be a adventurous visitors.. Hike, climbing, rafting, biking. When done drop in the Icicle Brewery. You have to drive or take a taxi into town. Leavenworth was fun, good food. Very handy to Leavenworth. Lots to see and do in Leavenworth but If you are thinking of Octoberfest, book Real early. This town is packed in October. Leavenworth is worth seeing once at least and if you can arrange it do the farmers market in the park. We had a great time good music, food and friendly people. I do not think Leavenworth would be a good place to visit when it was tourist season. If you have a smaller rig say less than 36 feet I would try staying at the state campgrounds that are out a little further. There were a couple of spaces that would have taken my 40 foot rig I think. Are you affiliated with Icicle River RV Park ?